The Rich Peat Edition of Angels’ Nectar Blended Malt Scotch Whisky, from Grantown-on-Spey based Highfern Ltd, has been shortlisted in the 2016 Highland and Islands Food and Drink Awards, for the Best Drink Award. The Highlands & Islands Food & Drink Awards are now in their 12th year and celebrate the best of food and drink from across the Highlands and Islands and the Cairngorms National Park. 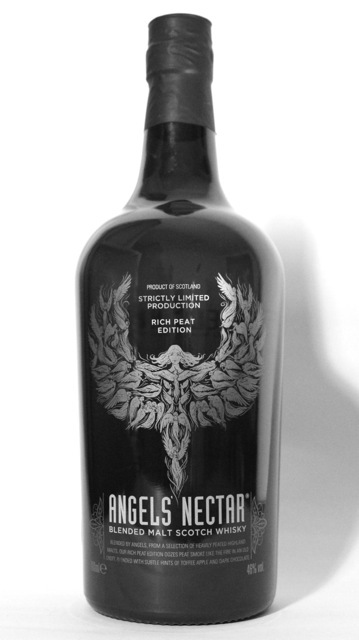 Inspired by the Angels’ share, the traditional name given to the whisky lost to evaporation during the maturation of Scotch Whisky, the Rich Peat Edition of Angels’ Nectar Blended Malt Scotch Whisky has been created from a selection of Highland malt whiskies, and oozes a welcoming peat smoke, with hints of toffee apple and dark chocolate. With its innovative ‘Angels within Angel’ graphic design (which won the 2015 Scottish Creative Award for Illustration), Angels’ Nectar presents a much-loved story from whisky folklore in a contemporary fashion. Judging for the awards took place at the Kingsmills Hotel in Inverness with a panel of judges examining and tasting the entries. The judges included representatives from Highlands and Islands Enterprise, Scotland Food & Drink, and the current Ambassadors of the Year, Jill and Callum Clark of Connage Highland Dairy. The winners will be announced on Friday 21st of October at a glittering awards ceremony at the Kingsmills Hotel, hosted by comedian and broadcaster, Fred MacAulay.